Heather is a pastel coloured, tie-dyed unicorn cat with large, glittery button eyes. Her left eye is blue and her right is gold. She has a white muzzle and a bright pink, sparkly button nose. The inside of her ears are peach coloured and she has a large, sparkly silver horn on top of her head. Heather was released in June 2018. Her Birthday is on 26th April. 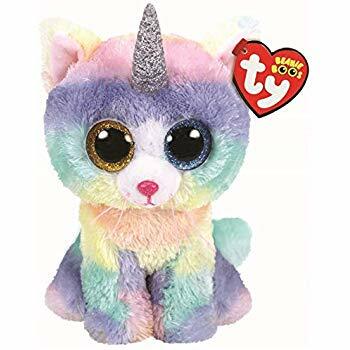 She is one of the first three Beanie Boos that have a horn but are not a unicorn. The other two are Ramsey the Unicorn Lion and Enchanted the Unicorn Owl.